Hideki Matsuyama won the third Asia-Pacific Amateur Championship with a superb final round 67 at The Singapore Island Country Club (SICC). The 19-year-old defending champion, who won the title in his native Japan in 2010, collected five birdies in a bogey-free final round to finish 18-under-par and one shot clear of South Korea’s Lee Soo-min. Victory provided a return for Matsuyama to the Masters Tournament at Augusta National, where he made history in April 2011 by becoming the first Asian golfer to win the Silver Cup for low amateur. 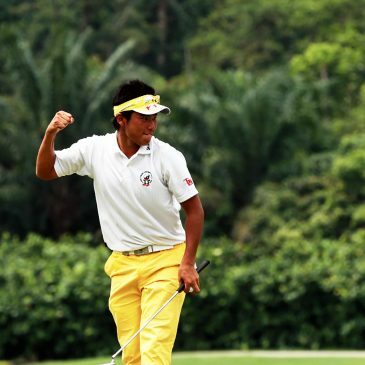 In Singapore, the Japanese star was never behind after the first hole but faced competition from Lee, who signed for the lowest score of the week after a birdie on the 18th hole secured a round of 64. Overnight leader Ben Campbell also stayed in touch after recovering from a difficult start to shoot 70 and finish in third place at 16-under thanks to late birdies on holes 16 and 17. However, Matsuyama continued to hit fairways and greens and secured back-to-back wins with a tap-in par on the 605-yard 18th. His final total of 270 consisted of rounds of 67-71-65-67 over The SICC’s New Course, which set the record for the lowest 72-hole score in the event’s history. He has also recorded a sub-par score in every round he has played in the competition. The Tohoku Fukushi University student continued his great form from the third round with birdies on holes 1, 8, 9, 12 and 16. A rare missed green on the 15th provided hope for his opponents, but a deft chip making full use of the green saw him make a comfortable par and stay one shot ahead of the field before going a further shot up at the next hole. The top 12 was made up of players from Japan, Korea, New Zealand, Australia, Singapore and Malaysia. A total of 120 players from 35 countries began the championship, which had television coverage broadcast in 150 countries. The Singapore Island Country Club, located about 10 kilometres from downtown Singapore, has an enviable reputation as a host of major international golf events, including the 1969 World Cup, 1993 Johnnie Walker Classic, 28 editions of the Singapore Open and the European Tour’s Singapore Masters in 2001. A one hour weather delay occurred just 10 minutes after the first round started, though play was ultimately completed before darkness. Weather delayed the start of the second round by two hours, which meant 30 players were unable to finish on Friday. Morning storms delayed play again on Saturday, but the second and third rounds were completed by day’s end.